In pictures, left, Archduchess Gisela of Austria, right, the archduchess and her husband with their children. Archduchess Gisela of Austria was sober like her father, a total opposite to her free-spirited but frequently-absent mother, the beautiful Empress Elisabeth of Austria. Even as a child, Gisela preferred her grandmother, Archduchess Sophie, over Sisi. The archduchess being soft and caring to her grandchildren, the typical doting grandmother, while remaining icy and stern to her daughter-in-law. She was 15 when she was betrothed to marry Prince Leopold of Bavaria, her second cousin on both the maternal and paternal sides. Prince Leopold was actually in love with the beautiful Princess Amelie of Saxe-Coburg-Gotha. Sisi's brother, Duke Maximilian Emanuel in Bavaria, besotted Amelia and not wanting to break his brother's heart, the Empress arranged for him and Amalie to meet at Gödöllő Palace. 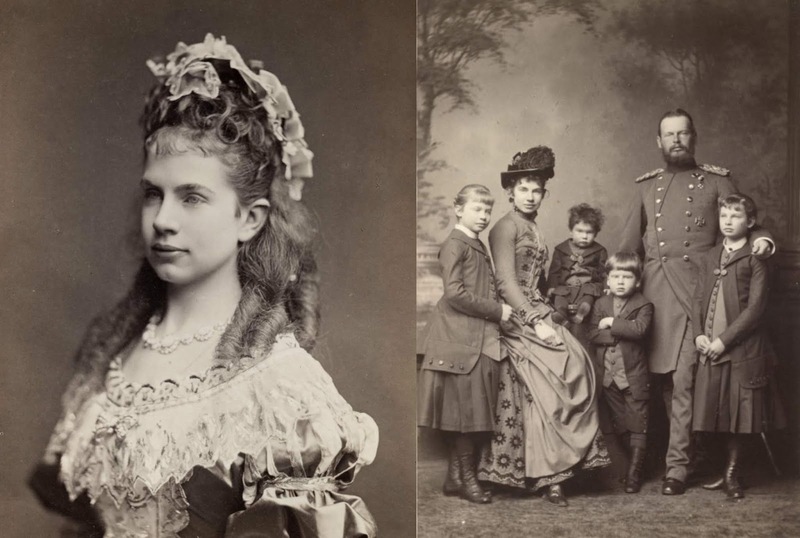 One of Sisi's guests was her cousin, Prince Leopold of Bavaria, who was already told that a marriage between him and Gisela was favored by Emperor Franz Josef. To be the son-in-law of one of Europe's most powerful sovereign weighed heavier than his infatuation to Amalie. Franz Josef wanted a Catholic husband for his daughters and at that time, there was a shortage of Catholic princes who were deemed eligible enough in the eyes of Franz Josef. When their engagement was announced, Prince Leopold received half a million guilders as dowry. Archduchess Sophie, however, objected. She thought the marriage "is no match. “Elisabeth, meanwhile, thought Gisela was too young to marry, although she herself was as young as Gisela when she married the emperor. It was decided that their wedding should take place after a year . According to Alan Palmer, the empress' critics insisted that "in her craving for eternal youthfulness, Elizabeth wished to put off the reality of becoming a grandmother as long as possible." Archduchess Gisela of Austria and Prince Leopold of Bavaria were married without Sisi around, amidst great festivities. They established their residence at Palais Leopold in Schwabing and had four children, who all survived through adulthood. Gisela was particularly close to his only brother, Crown Prince Rudolf, and his death after suicide severely affected her. After this, the archduchess became active in various social and political activities, establishing charities that helped the poor, blind and deaf At the height of World War I, she converted her palace into a military hospital and when the monarchy was toppled, Gisela refused to leave Munich but, instead, remained and participated the 1919 elections for the Weimar National Assembly where women above the age of 20 were allowed to vote for the first time. The Bavarians’ esteem and affection towards Gisela never wavered until old age. Such was her popularity that they called her the Good Angel from Vienna. The still-active paddle steamer Gisela on the Traunsee and the Gisela Gymnasium in Munich were named in her honor. Archduchess Gisela Louise Marie of Austria was born on July 12, 1856. She died on July 27, 1932, in Munich.